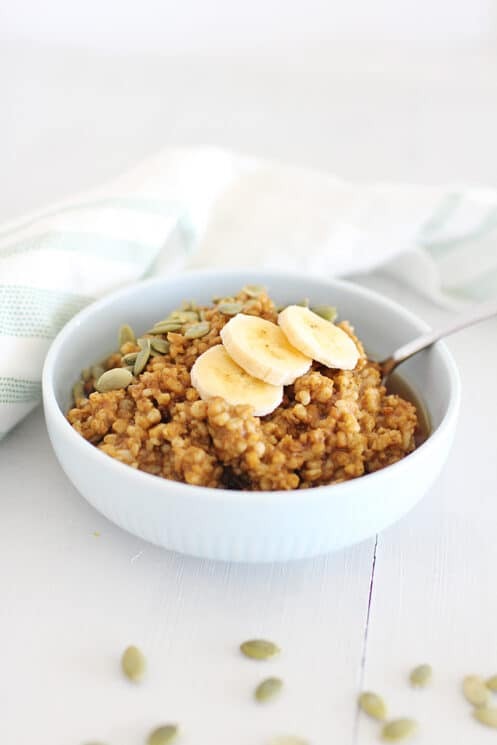 Pumpkin Pie Slow Cooker Oatmeal is anything but your Grandma’s oatmeal. 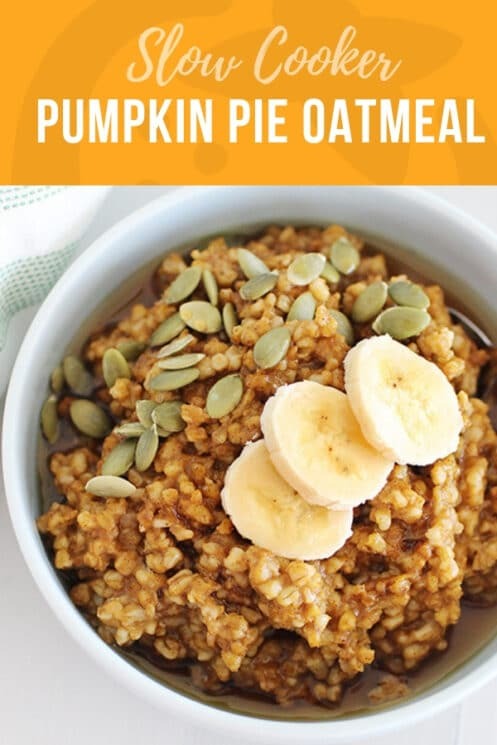 It is has an amazingly delicious Fall flavor that will get you out of bed in the morning ready to eat breakfast! I am the ultimate early bird and enjoy waking up before the sun in the quiet of the early morning hours. I love making a delicious breakfast in the morning without being rushed. This, guys, is my bliss. However, I am often reminded by my not-so-early-bird friends that this is not everyone’s bliss. On hectic work/school mornings, some people are barely awake enough to coordinate matching socks, much less awake enough to figure out a hot healthy breakfast to fuel their family for the busy day ahead. For those people, worry not! There is a way to get a delicious, nourishing breakfast ready on those “active” mornings while still hitting your snooze button a few extra times. 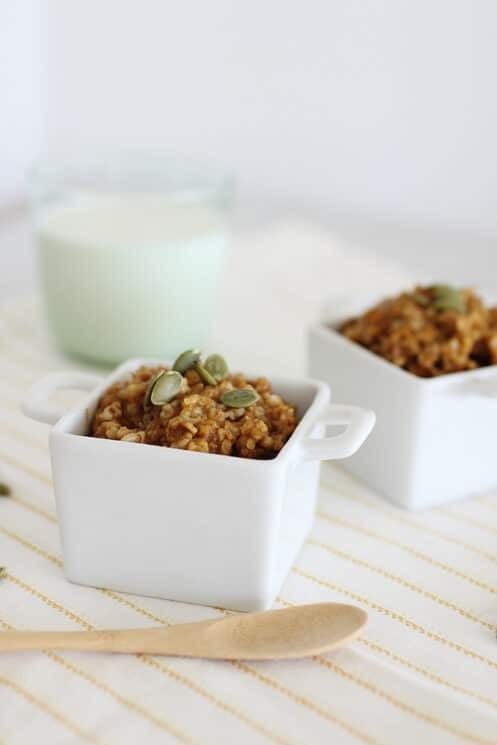 Allow me to introduce you to slow cooker pumpkin pie oatmeal. Slow cookers are often renowned for cooking pot roasts or beef stews to perfection. But my favorite kitchen appliance (sorry dishwasher) is also capable of making a delicious oatmeal while you are busy catching Z’s. Just pour the ingredients into your slow cooker before you head to bed, give it a stir, turn it on, and in the morning, you will wake to a healthy hot breakfast that is ready and waiting to be gobbled up by your hungry crew. Note: I used a 6-quart slow cooker when making this recipe. If your slow cooker is smaller, make a half batch to prevent overflow while cooking. Pumpkin just might be the unofficial flavor of fall (and what a wonderful flavor it is). With fall slowly appearing, it only seemed appropriate to give this hearty breakfast an autumn twist. Plus, pumpkins are wonderful things to sneak into your diet wherever you can. Those beautiful seasonal fruits are rich in fiber, beta-carotene, and vitamins A and C. Combine the beautiful orange pulp of a pumpkin with a little nutmeg, cinnamon, ginger, and natural sweetener, and you have a healthy breakfast that tastes like dessert. 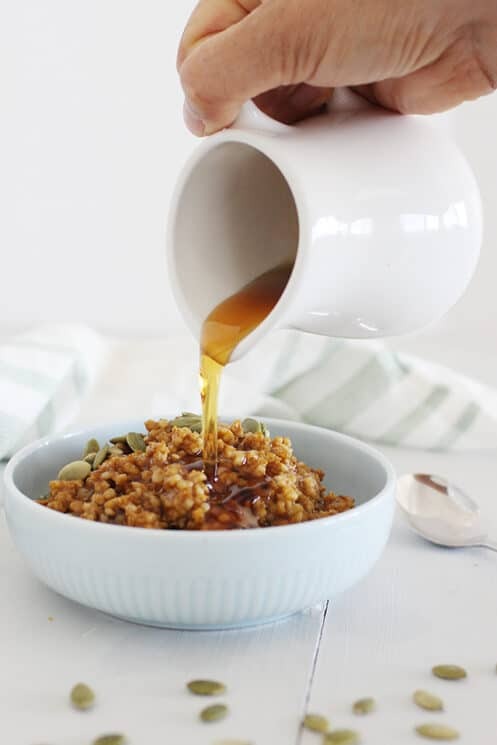 This Slow Cooker Pumpkin Pie Oatmeal Recipe makes a pretty hefty batch, perfect for feeding a crowd (Thanksgiving morning, perhaps) or for making ahead and storing in individual containers in the fridge for quick breakfasts on the go. It even freezes nicely so that you can cook once and enjoy at your leisure for weeks to come. Using a pastry brush, coat the inside of the slow cooker with melted coconut oil to help prevent the ingredients from sticking during the cooking process. Add all ingredients to the slow cooker, stirring to combine. Once done cooking, the oatmeal may look liquidy; this is normal. 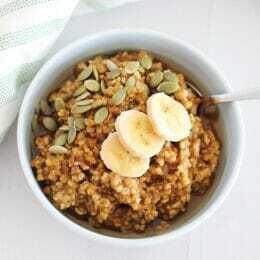 Give the the finished oatmeal a good stir before serving hot. Store leftovers in the fridge for a week, or in the freezer for a month. Hi. This looks delicious, too bad i don’t have a slow cooker :-/ . By any chance you have a stove top version :-)?! 1. Combine the coconut milk and water in a large sauce pan and bring to a boil over medium-high heat. 2. Add the remaining ingredients to the pot (except the coconut oil, which can be omitted from the recipe entirely if cooking on the stove top), lower heat to low and simmer for 20-25 minutes, stirring occasionally. It’s really bland, am I missing something?